How close are you to having everything online? I sleep well at night knowing that virtually all of my personal information is stored online. Really, the only personal data that is not permanently stored online are my photo albums and my music collection. However, these files are backed up nightly to a remote online server (iDrive). I know that I can move the last of my data online without too much effort, but I really do not see a benefit. I sleep better knowing that my documents are stored on some of the best storage arrays, operated by some the the best admins, located in good data-centers. If my house burns down, or is broken into, my data is safe and accessible. It is critical that you practice very good password management and keep your computer clean from (x)ware. I do understand that these large companies can lose data as well or even shutdown the service all together. It is just a lot less likely they will suffer a loss verses an individual person. As a precaution, every other month, I change all of my passwords and download all my files that I then burn on to a couple of DVDs. I trust the platforms of Google and Microsoft more than I trust any single computer. I have moved all of my “Office” type documents to Microsoft Office Live Workspace. I was using Google Docs for a while, but I did not like some of the minor formatting changes that happened to my historical Microsoft Office documents. I still strongly feel that Google Docs would make a good choice for a smaller start-up that had limited resources. That being said, I have found that Office Live Workspace is really suited to my personal and family needs. I use Microsoft Office extensively and it integrates perfectly with Office 2007. 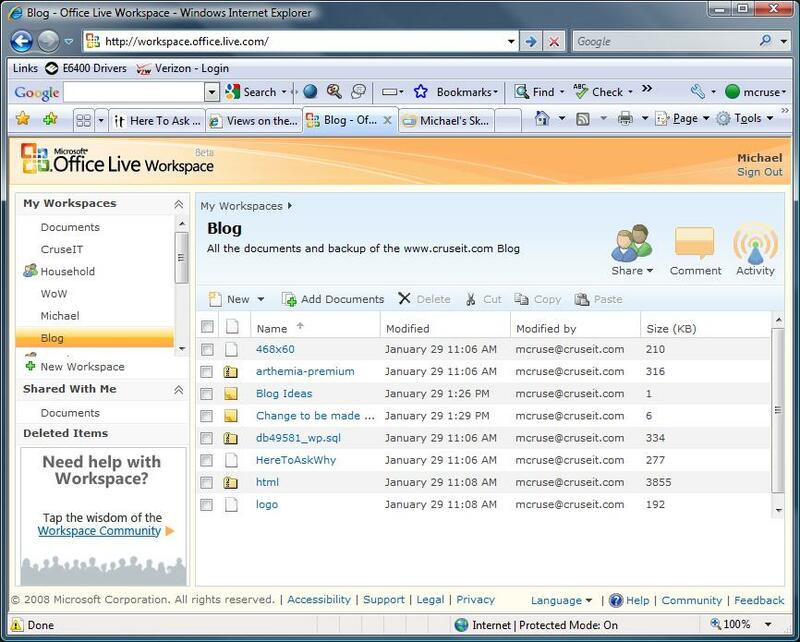 I can see many uses of Office Live Workplace in smaller companies that have investment in Microsoft Office, collaborative groups, or companies that have a field presence. I have access to all of my documents no matter where I am or the computer that I am working on, obviously Internet access is required. I can use a web browser or access documents or right from the open menu in Office. I may not be able to edit some of the documents if I am on a computer that does not have Microsoft Office (or OpenOffice) installed, but I can certainly view them all. And really, this works just fine for most situations. Microsoft recently increased the storage of Live Workplace to 5 GB, and this easily handles all of my personal documents. You create document workspaces, folders, and can share the workspaces with other people. Right now, my wife and I share a couple of workspaces that contain the common household documents. I have other workspaces for personal research, blog ideas, old work files from my consulting days, etc. This is by far one of the most productive, FREE, services that Microsoft has released. If you take Office Live Workspace with Microsoft’s SkyDrive service, which includes 25GB of free storage, you can really start storing massive amounts of information online. Obviously you want to use some common sense about what you store online, but I have found it to be incredibly useful. I am about simplifying my life, and my computing needs. This is just one person’s honest appreciation for quality services.